Geraint Thomas, Chris Froome and Tom Dumoulin are among a group of riders to have signed a letter calling for the International Association of Professional Cyclists (CPA) Presidential election to be postponed after claiming this week’s vote is not valid. The Grand Tour winners are among 27 riders to have signed the letter, dated September 21, which is addressed to CPA President Gianni Bugno and the Steering Committee. Bugno, the 1990 Giro d’Italia winner, has led the organisation for the past eight years and is hoping to secure a third term when the vote takes place on Thursday (September 27). The CPA is the International Cycling Union (UCI) recognised association for professional riders, with the group aimed at defending their interests and rights, as well as improving working conditions. The CPA Presidency is being contested for the first time, with former British rider David Millar having declared his candidacy to lead the organisation, established in 1999. Heads of the Italian, French, Spanish, Portuguese and North American rider’s unions are able to vote on behalf of their riders. This is due to the officials sitting on the CPA’s Steering Committee, with their unions their only full members. Australia and England among those featuring as guests. It is expected that the Italian, French and Spanish unions, who have the largest share of the vote, will opt to back Bugno. Riders will also be able to vast their vote individually from non-member affiliated countries, however they will only be able to do so in Innsbruck. 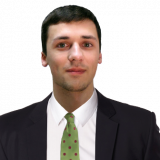 A request for an electronic ballot was turned down due to a current CPA statue stating that any proposals for changes have to be made in writing 30 days before the General Assembly. "We are professional cyclists employed by World Tour teams and are individual members of the CPA,” the group write in the letter. "We fund the CPA with a portion of our prize money, we count on the CPA to represent us on UCI commissions, we contribute a portion of our money to be held in the CPA's Solidarity Fund, and we are subject to the terms of the Joint Agreement the CPA negotiates with our employers. "We and many other members of the pro peloton feel strongly that the election is unfair and being forced through in order to guarantee your victory and leadership of the CPA for another four years. "The riders that you claim to represent are spread all over the world and cannot possibly attend an election in person due to their contractual obligations elsewhere. "Furthermore, our individual votes combined cannot compete against the power of the member associations. The letter then claims this week’s election was “improperly organised” and therefore invalid. The riders accuse the CPA of being in breach of two articles in their statutes, which are related to the organisation’s General Assembly. Article 14 states that "notice of meetings must be sent to each member by post, fax, or e-mail, and published on the website, at least one month prior to the date of the meeting". It is alleged by the riders that they were only notified of their ability to vote by email on September 9, only 18 days before the meeting, rather than the required month. They claim the CPA failure to notify all members in time, in addition to the alleged breach of the statutes, made it impossible for them to submit proposed amendments 30 days in advance of the meetings, such as a request for an electronic vote. "We are aware that a CPA General Assembly has already been held this year, on the 5th of March in Paris,” the letter states. Along with reigning Tour de France winner Thomas and Giro d’Italia champion Froome, current world time trial champion Dumoulin is also a signatory of the letter. Spain’s Alejandro Valverde, Germany’s Marcel Kittel and Austria’s Bernhard Eisel, the current men’s road representative on the UCI Athletes’ Commission, have also put their names to the document. 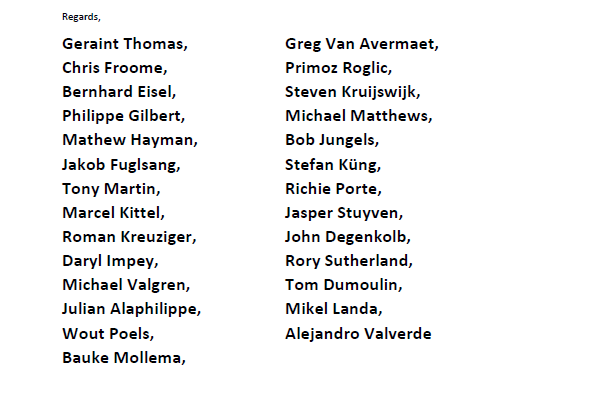 Signatories also include Philippe Gilbert, Mathew Hayman, Jakob Fuglsang, Tony Martin, Roman Kreuziger, Daryl Impey, Michael Valgren, Julian Alaphilippe, Wout Poels, Bauke Mollema, Greg Van Avermaet, Primoz Roglic, Steven Kruijswijk, Michael Matthews, Bob Jungels, Stefan Küng, Richie Porte, Jasper Stuyven, John Degenkolb, Rory Sutherland and Mikel Landa. 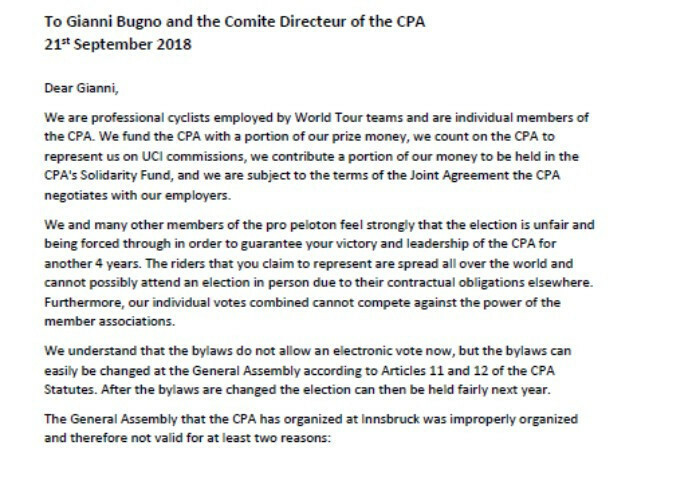 The riders state in the letter that due to the alleged statute breaches, it is not possible for CPA to hold a valid General Assembly at Innsbruck that complies with their statutes. They request that the “election of CPA President be scheduled in 2019, and with enough notice to give other candidates time to prepare and put forward campaigns". "Before the election in 2019 the CPA pass amendments to the Statutes that will give an equal vote to all professional riders and an independently managed electronic vote," they add in the letter. "Immediately, all riders in the peloton must receive by e-mail the financial statements through 2017 of all accounts controlled by the CPA, including the Solidarity Fund, and including any reports from external auditors that reviewed the accounts. The CPA have previously defended their record, claiming their efforts have led to riders being represented on all UCI Commissions and have contributed to a boost in safety through the introduction of the extreme weather protocol and pressuring the UCI over the use of disc brakes. Boosts to prize money and increases in the minimum wage of riders have also been touted as achievements by the CPA. The CPA will be viewed as an important voice in the debate around the UCI’s latest round of WorldTour reforms, which could come into force for the 2020 racing season. UCI President David Lappartient will unveil plans for the sport’s reform during the World Championships, with the Frenchman having already come under pressure from the International Association of Professional Cycling Teams over his proposals.